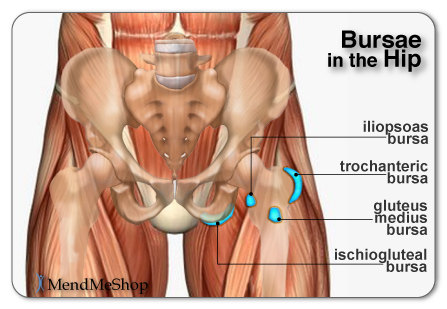 Iliopsoas Bursitis, believe me when I say, you don't ever want to suffer from this ailment. I have learned over the past week that bursitis hurts and even read in one article that it is more common when you get older. Thanks....really needed that info. Very helpful. I tend to workout like a crazy lady. 2 hours in the gym is not uncommon for me. It is my escape, my stress reliever and where I go to regain my sanity. Last Tuesday, I finally had a day where I could spend as much time in the gym as I wanted. No deadline to run out to, just finish to exhaustion and then go home. Yes Karen, forget about the fall you took last week and how your hip hurt after. By all means, just pump it out at the gym. Really, don't congratulate me here, it was actually really stupid. I haven't been able to be as consistent with my workouts. But, that didn't stop me from believing, "Hey, no problem. I've got this workout in the bag!" Well, the next day, I realized that bag I thought I had was way overloaded and my body was about to let me know that I big time over did it. I took a step in the afternoon, "Ouch!" What was that?" A little later, another step...."Ouch! Okay, what is going on here?" Stepped out of the car later in the afternoon..."OUCH! I can hardly put weight on my leg!" Then, I proceeded to ice, stretch and try and convince, pop, stretch or destroy my body into believing that it was fine. I really should know better, but I am totally incapable of being objective when diagnosing my own body. I tell myself...."You HAVE to get to band practice, the concert is next Saturday and if you miss it, that would be BAAAD!!" Let's just say, when I got into the parking lot and tried to get out of the car, I nearly fell on the pavement. "OUCH!!! OUCH!! OUCH!!....." It went on like that for about five minutes until I finally gathered enough courage to step on my foot and get into the auditorium. I lasted about an hour standing, before I ended up laying on the floor. My concert participation is now toast! So, visit to the PT confirmed....iliopsoas bursitis. Old people ailment. Icing all week, on crutches, not fun. Please take my advice....don't overdo it in the gym if you haven't been going consistently. Ease back into it (insert weekend warrior joke here), stretch lightly after your workout, and if your hip kind of hurts because you fell and strained it the week before, don't power through it. You might actually need some rest, ice and ibuprofen. (Karen? Are you listening? Yes, you! I'm talking to you!) Or, you might end up like me, watching your band perform instead of being in it....(insert sad violin music here). Anyone know where the balloons are? It's time for a Karen pity party, and I'm going all out this time!! Chocolate will be consumed. Here's a little diagram in case you are curious what this little "bursa" thing is that can cause an idiot like me so much pain! Be scared, be very very very scared of annoying the bursa. Most disgusting dessert I have ever made!! Just wanted to share this important tip about Mango's. They are really stringy. When you cook them, they are even more stringy. Which in your mouth, tastes a bit like you have eaten a large hair ball. Cat's must feel about the same coughing up a hair ball as I did trying to eat this. I like cats, but that is taking it a bit far. So, warning...when you cook with Mango's get the kind that aren't stringy. Asian brand. The experience of trying to eat this dessert ruined me from trying another mango dessert...maybe someday!